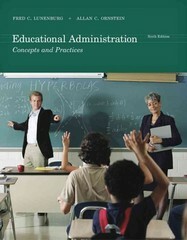 Educational Administration 6 Edition Now in its Sixth Edition, EDUCATIONAL ADMINISTRATION: CONCEPTS AND PRACTICES is the best-selling and most comprehensive book of its kind. The authors discuss all topics necessary for a complete understanding of educational administration, balancing theory and research with practical coverage of culture, change, curriculum, human resources administration, diversity, effective teaching strategies, and supervision of instruction. Many in-text features help readers learn, comprehend, and apply the material.